I estimate 40% of my time invested in this particular painting will be in what I call the "research phase". Hard to believe? As you'll see, if less time is spent, I'll surely have to redo the painting or spend countless hours painting several images. This is the phase some artists want to short circuit or skip altogether. This front-end planning will save time in the long-run, make my painting experience enjoyable, and will more likely satisfy the client. I meet with my client in the same location where the new art is to be installed. I ask many questions about what kinds of art they have already viewed, what styles they like and don't like, what colors they like and don't like, whether they think they prefer a pure landscape or one with architecture, whether they want figures, flowers, or animals in the painting, and who else may have input into the planning process, etc. I also ask to see the rest of their home to evaluate other art that's hanging. This will facilitate making something that will be harmonious and not conflict visually with the rest of their collection. As I ask questions I can get a sense of whether the client wants to control the painting or if they are giving me total freedom. This client made it clear that the latter was the case. In this case, my client has a semiformal living room, with new furniture, and high vaulted ceiling in their recently built home. The walls are neutral cream, hardwood floors, some wood furniture, and multicolored upholstery and pillows. The room itself overlooks a beautiful hillside landscape from a lovely bricked balcony. The client helped me with some of the more lengthy physical measurements. 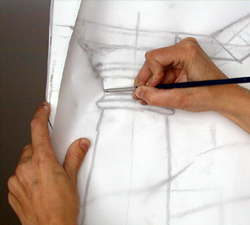 Clients sometimes love to participate in the process, no matter how small the task. This is not always the case. (I knew from creating other paintings for this client that we worked well together.) I took measurements of the spot where the painting would hang, right over a small sofa. Right away, I could see that a typical horizontal painting would visually flatten the open feel of the vaulted wall, especially with the narrow sofa. So I suggested a square or nearly square painting for the space. This would maintain the open feel of the towering wall. We decided on the best finished, framed size for the room. Next, the most critical step is the color. I asked the client if I could color match a few things. 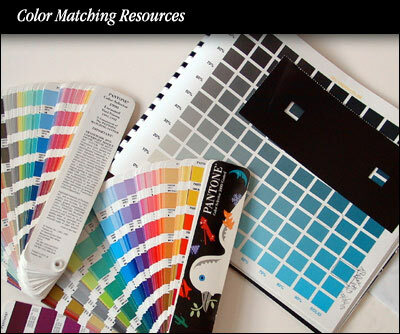 I use Pantone and process printing swatch books, both in coated and uncoated versions (shiny and matte) to match colors with. These resources are compact, convenient, and easier to use actual tubes of paint. I travel around the room with books in hand matching all the colors I can, categorizing as to which are the most dominant and which are accent colors. I even match the hardwood floors and wood furniture. Since this was a new home I also asked the client to make a quick wall paint sample for me as well as supply any actual furniture fabric samples. She had both which was a bonus. I could take these back to the studio for further study. Try to do your color matching during the day. Since the colors in a room are dramatically effected by times of day, you may even want to test at a couple of different times. The next thing I do is take some reference pictures of the actual room. I don't use these for color as much as to remember how things look. It is tough to trust so much to memory. 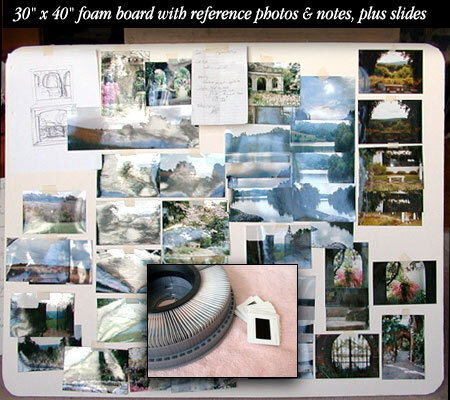 I refer frequently to these photos when I want to think about being in the client's environment again while painting. Photos also reveal things I missed when visiting the client, like accent pieces or the fact that the drapery material was the same as on their side chairs. I shot photos of this room with and without the lights on to see how the room colors react to light changes. After all this effort, I may or may not use much of the information collected. Armed with this material however, gives me clues as to which colors to avoid as well as which to integrate into the final painting. 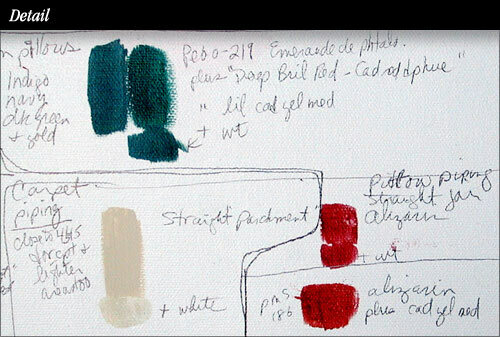 Back in the studio, while still fresh on my mind, I make a complete color profile of the client's room for reference. 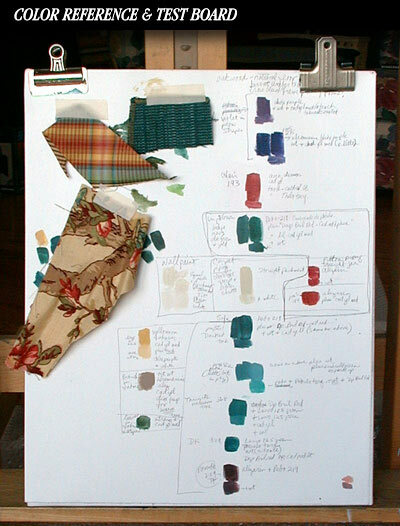 I first tape down fabric samples then mix paint matching the room colors that were identified. 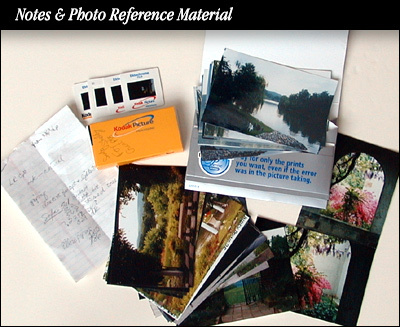 Notes are made as to the paint colors used and in what amounts. Since this will be an acrylic painting, the test board is made with acrylics on a piece of the same linen primed canvas that will be used for the final painting. With all the information collected, and much thought, I make rough sketches...as many as it takes to pour out my initial impressions. They are not detailed -- anything goes at this point. A bit of free thinking and dreaming. 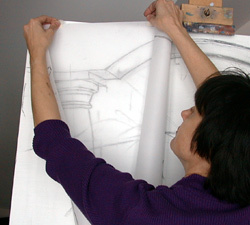 More often than not, some of the earliest concepts are used in the final painting. I call the client to give her a verbal idea of the options I am considering to get her response. She likes a couple of the concepts and reinforces that she wants me to do what I think best. Her thoughts and feedback are important to me before proceeding. Now that I have a basic idea of what will be painted, I mount selected sketches, notes, and photos, to a 30 x 40 foam or mat board (below). While painting I can instantly refer to the board at a glance rather than always flipping through a stack of pictures. I use as many boards as are needed for the project. In this case, I find one is sufficient. YEAH! Now I can really start--finally! I stretch and prepare a 30"x 40" canvas on stretchers. With the frame added, it will be exactly the size needed. 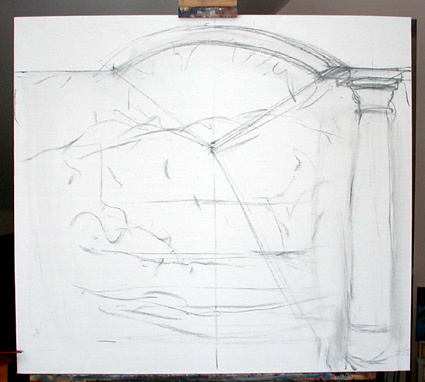 Before I begin drawing, I position the canvas on my easel at the approximate height it will hang on the client's wall. I want the viewer to see the scene as if they were standing at the actual landscape site. And since there will be architecture in this painting the perspective must be correct. A bit of measuring assures that the proportions and scale are right. I begin the drawing with a very loose, stroke, working the whole canvas at one time. The preliminary sketches I did are used as reference. 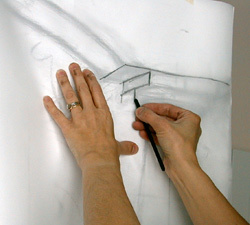 Many adjustments are made when translating from a tiny sketch to the actual painting. With a damp cloth nearby, changes are easily made while sketching. I don't want to overload the canvas with charcoal. One of the first things indicated is the point at which the viewer will be looking at the horizon. I have decided on symmetrically balanced, 1-point perspective radiating from about two-thirds up on the canvas. This may change slightly, but is close to what the final position will be. 1. 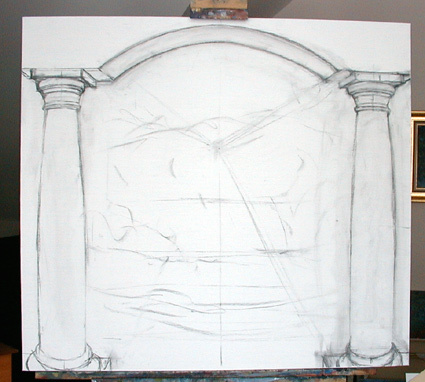 I work out the structure of the right pillar first; the perspective dictated by the center point marked earlier. I also decide how big to make the pillars. I want them to look the same as those in the client's home, but not so large so as to overpower the painting. I also have to decide how tall the arch will be. It has to be a soft slope, again to match the house. I decide that the top part of the wall is too low and blocks too much of the landscape opening, so I raise everything up a bit. 2. With the right pillar completed I want the left pillar to be identical. 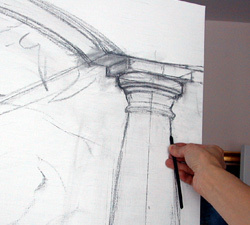 Here's a tip for you... To save time and assure accuracy, I tape a large piece of tracing paper over the finished pillar and trace the image with charcoal. 3. 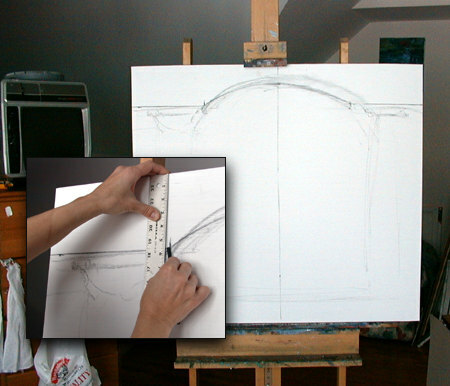 I remove and flip over the traced image, move it into position, and re-tape to the left side of the canvas. Voila, two matched pillars. Just a word about the bases. 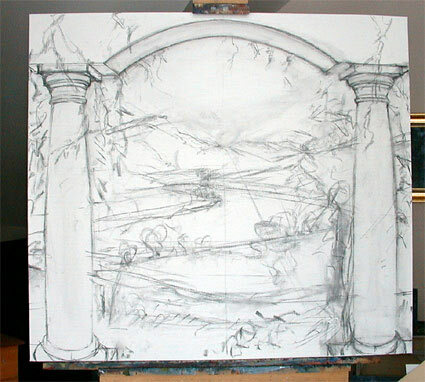 I first had the pillars running straight off the bottom of the canvas, but that led the eye right off the painting. Then I put the two complete bases inside the picture; that looked too cramped. I elected to place them just off the edge to stop but not trap the viewer's eye. We'll see if this works at the painting stage. I will continue to make adjustments to the pillars, but they are fine for the moment. Now that the architecture is roughed-in, I can have some fun playing with landscape possibilities. The client would like an open landscape with sky. I will also include a river to break up the mass of green that would otherwise dominate. 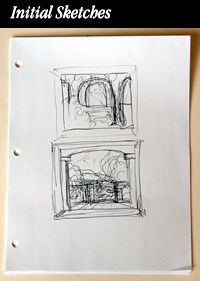 In the back of my mind while drawing I am thinking about the room colors and how they can later be incorporated. As I draw the landscape I decide to devote lots of space for sky and the distant mountains. I have to be careful not to overdo the volume of "things" in the painting. It will be viewed from across a room, so too many little things will kill the overall effect. The arched wall/pillars, the distant mountains, and foreground are fairly horizontal. I was originally going to put in a horizontal river, but I bend the river instead. This will take the viewer into the painting via a classic route. I play with a few tree possibilities then see that the pillars and wall appear to be very stark. A few sketchy lines are added to indicate a touch of leaves and vines...not too much, or it will look busy and overly romantic. I want the viewer to stay inside the painting not look at the periphery. One other thing that I had not thought about until now. The room's windowed balcony is to the right of where the painting will be. Therefore, the light source in the painting will also come in from the right. This painting will undoubtedly be moved to another location over time time. My decision to positioning the light source to the right will work wherever the painting is placed. But for now, will add a realistic lighting effect that works with the living room.